What is next for Perch Shop? Perch Shop has taken over a year to launch. It contains more code than Perch Runway itself and was a huge undertaking. However e-commerce is a huge subject, with lots of edge cases. We already have our eye on lots of things we would like to add to Shop - and we are sure you’ll have plenty of feature requests too. As with everything in Perch we listen to what you need, and so we’ll be guided by you in terms of which features we add next. Here are some of the ways we’ll work with you to make Perch Shop the best e-commerce option for you and your projects. 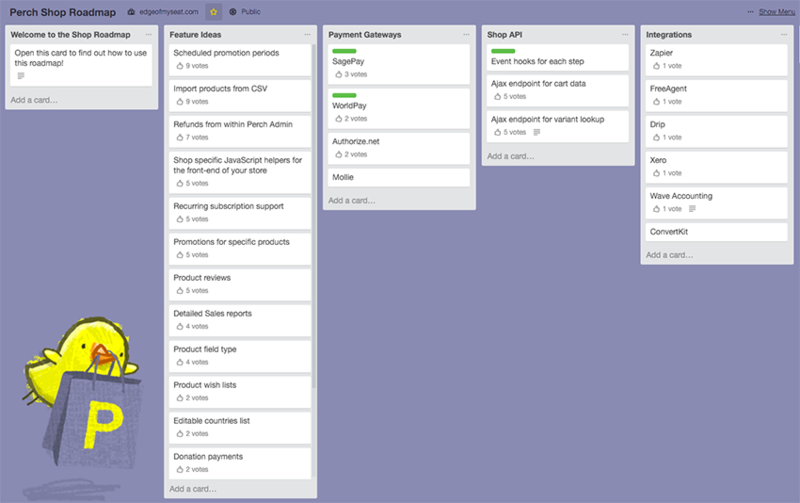 We are sharing our roadmap for Perch Shop. You can vote on features and see what we are currently working on. Email us if you have a feature suggestion for the board. Visit the Perch Shop Roadmap. Perch Shop uses the OmniPay PHP Library behind the scenes to integrate with gateways, so on paper you should be able to have Shop taking payments via any of the official or third party gateways. However, things are never so simple, and as not all gateways are equal some of them are going to need a little help to properly hook up with Shop. To make life harder not all of these gateways make it possible for us to access a test account in order to confirm they work. We are flagging up in the documentation which gateways we have seen working with Perch Shop. If you are using something else and it is supported by OmniPay, raise a support request via the forum in the usual way and we’ll take a look. If we are able to test with your test account we should be able to get it working for you - however don’t wait until the day you need to go live to check! The roadmap will help us to assign priority to the features we add to Perch Shop, however as a small team we can’t give guarantees of when we will ship any feature. It may also be that your particular project needs something that is languishing way at the bottom of the features list, as it is too specific to get many votes. For these cases we can offer our sponsored feature service. For any feature that we would be happy to integrate into the product, you can contract the Perch team to add that feature for you. As the work will be completed by the Perch team and shipped in the product you can guarantee that it will be maintained, bugs fixed and compatibility with Perch and underlying PHP changes ensured. The work would be completed in the same way as any other consultancy work, with an agreed timescale and cost. If you would like to suggest sponsoring an addition to Perch Shop contact us with some details of what you would need to be added.